73-79 Cab FFTA-79 $6699. 73-79 Cab Shell - No floor FFT-69 $2299. 73-79 Tilt Front End FFTI-73 $1899. 73-79 Drag Package FFT-69P $3899. for as little as $50 w / purchase. FFT-10 $ 499. 73-79 Tilt Front GT-500 FFTI-73G $1899. 73-79 One Piece Front End FFT-65 $1499. 73-79 Tilt GT-500 Presplit FFTI-73GP $1999. 73-79 OPFE GT-500 FFT-65G $1599. 73-79 Front Fenders pr. FFTF-73F $ 778. 73-79 Front Fenders pr. FFT-26 $ 698. 73-79 Doors pr. FFTD-73 $ 848. 73-79 Doors pr. FFT-34 $ 898. 73-79 Fleetside Bed - 8' FFTB-738 $4599. 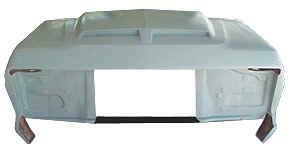 73-79 Fleetside Bedsides 8' FFT-56 $ 998. 73-79 Fleetside Bedsides 8 FFTB-748 $1098. 53-79 Stepside Fenders pr. FFT-71 $ 798. 53-79 Stepside Fenders pr. FFTF-53 $ 778. 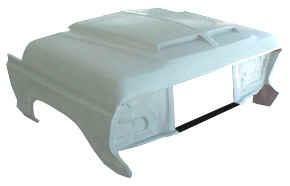 - Headliner is supplied and comes with a smooth pintable gellcoat interior finish. - Smooth gray gellcoat exterior finish. - Only available in Light Weight Lift Off design. - Heavy Duty version - comes complete with hinge kit. - Marker blanks require opening to install. - Box section side walls, with a smooth grey gellcoat inner and outer finish. - Gellcoated Fiberglass floors have a ribbed design - eliminated the need for a Wood kit. Please Note: We are unable to ship 8' Beds. They must be picked up in person to avoid freight damage.